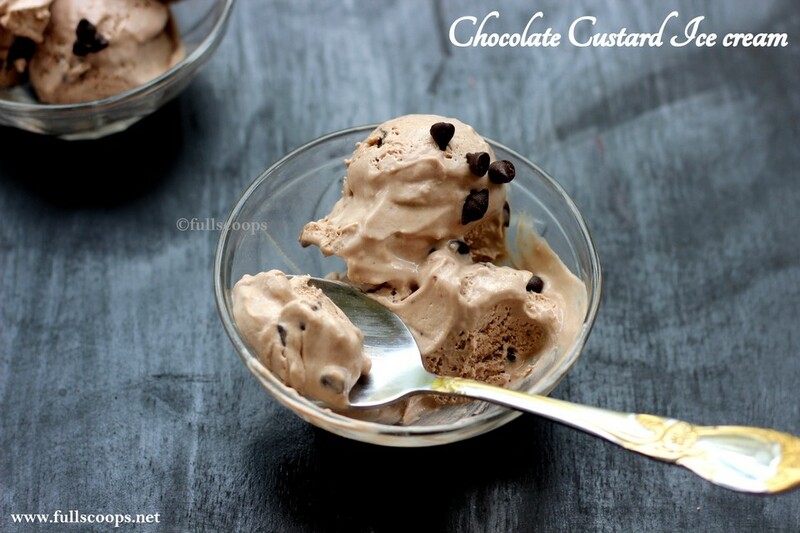 Chocolate Custard Ice Cream ~ Full Scoops - A food blog with easy,simple & tasty recipes! I had no idea of making this ice cream but when I make the Brooklyn Blackout Cake, I had about 1 cup of chocolate custard left over. So I decided to use it while making chocolate ice cream. And it turned out to be an awesome idea! This custard turned a simple chocolate ice cream into an exotic ice cream! 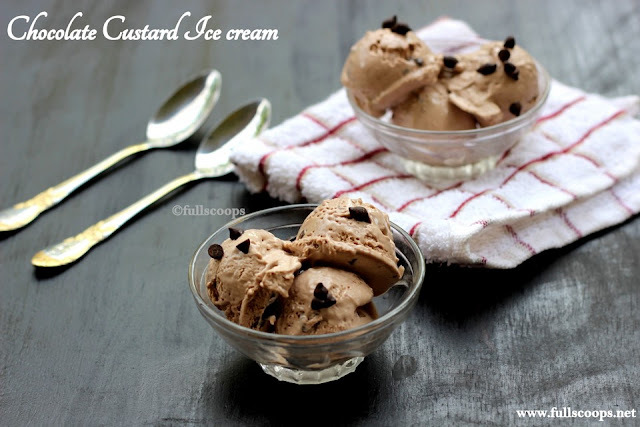 Everybody loved this ice cream so much that now a days, whenever I make chocolate ice cream, I make the custard exclusively to add to it! 1. For the custard - Make the custard first as it needs to rest awhile before we can use it in the ice cream. 2. Take the chocolate and coffee granules in a microwave safe bowl and melt it and set aside. Add about a 1/4 cup of milk to the corn flour and mix well without any lumps. 3. Take the remaining milk in a sauce pan, add the sugar, cornflour mixture, melted chocolate and salt. 4. Keep the sauce pan in medium flame and stir for about 5-7 minutes until the custard becomes thick. 5. Take it off the flame, add the vanilla and let it cool down. Then cover and let it rest for about 2 hours till it becomes thick. 6. To make the ice cream - Take 1 cup of cream in a steel bowl, add the vanilla to it and whip for about 5 minutes until it reaches a soft peak stage. 7. Add the fresh cream and beat again for 3 minutes. 8. Add the chocolate custard and beat well until it's fully incorporated. 9. Add the condensed milk and beat again. 10. Add the chocolate chips and mix well. 11. Transfer to a container and cling wrap and let it set in the freezer for 8 hours. I left it overnight. 12. Scoop out and enjoy! 1. I have used all the chocolate custard. 2. 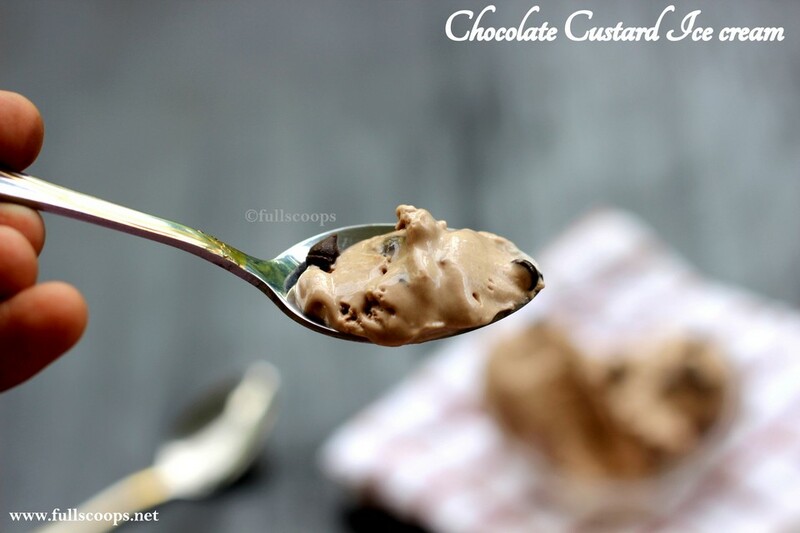 You can add the custard little by little and beat well to incorporate. 3. Make sure the custard is at room temperature. 4. I have used non dairy whipping cream (which is pre sweetened) as that is what I get here, if you use dairy whipping cream, use 2 cups of it and increase the condensed milk. No need to add the fresh cream then. 5. You can add anywhere between 1/3 to 1/2 cup of condensed milk depending on your taste and preference. 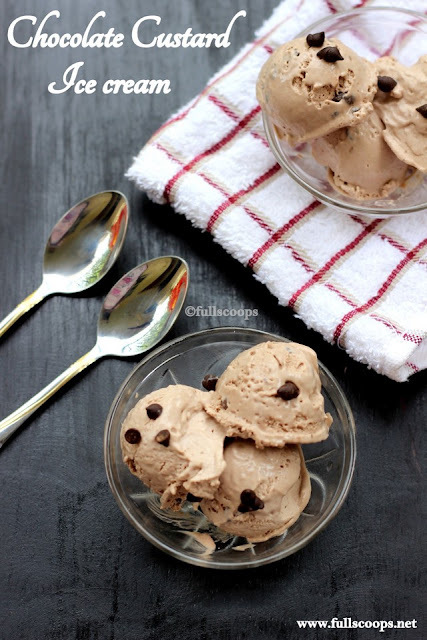 Thank you so much for a such a lovely post.Looks so yummy!Ice cream is my favorite.I likes to eat all ice cream with different flavors.But I can't to prepare ice-cream.When I try to make ice cream it does not come well. Try this recipe or the other ice cream recipes here in my site. It always comes out really well.